We are proud to unveil our unique and exclusive ThruFlow Engineered Oak Flooring, specifically designed for use with Underfloor Heating (UFH) with an aim of saving you money on your heating bills. 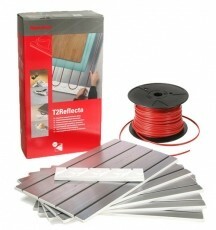 This incredibly simple but effective product was designed and developed in-house by our R&D team with the main goal of maximising the efficiency of UFH systems when installed in conjunction with our engineered oak flooring. 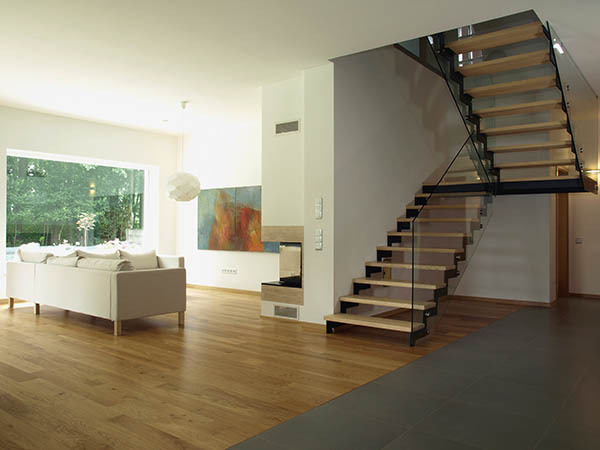 It is obvious that the thinner the oak flooring, the lower its thermal resistance is, and the better and more efficiently the UFH system below will function. 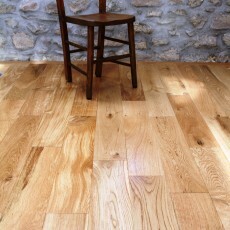 The biggest challenge though, is that everyone wants their oak flooring to last as long as possible, so having a thick enough oak wear layer is vital for longevity and value for money. 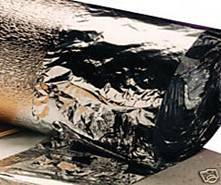 Anything less than a 4mm wear layer will not provide sufficient durability and will need replacing soon, ultimately costing the floor owner more in the long run. 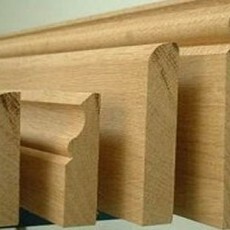 With this in mind, we designed our 15mm thick ThruFlow with a full 4mm oak wear layer, and a structural grade 21mm ThruFlow that has a full 6mm wear layer of European oak, meaning that it will last as long as most 18mm thick solid oak flooring. Both ThruFlow products have an underside of high quality plywood to maximise stability and strength after installation. 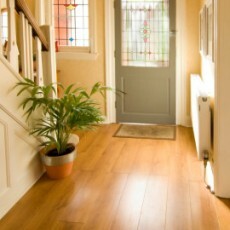 So what makes our ThruFlow Oak Flooring different from other engineered oak flooring designs? The key distinction is that all of our ThruFlow Oak Flooring has a pre-drilled plywood underside, which reduces the overall thermal resistance of the floor, thus allowing the UFH below to work more efficiently than with other similar thickness flooring. This precise pattern of holes is applied during the manufacturing process, and reduces the overall level of thermal resistance within the planks themselves. Simple tests have proven that our 15mm ThruFlow has a lower thermal resistance than other 14mm thick products, and this reduction creates a more efficient ‘through-flow’ of heat from the UFH below, therefore enabling far more efficient and effective heat distribution and performance. You will be pleased to hear that increased efficiency for your underfloor heating does not have to result in compromise on the overall aesthetics or performance of your finished floor surface. 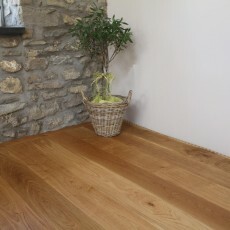 Both our ThruFlow Engineered Oak Flooring products are supplied with our brushed and natural oiled finish (by far our most popular), and not only does this finish provide a truly stunning appearance, the slightly textured surface means that it enhances the natural grain whilst still reflecting any light within the interior beautifully. This finish is also very flexible too. Should you require a different colour appearance for your finished oak floor; this can easily be achieved by simply applying another coat of Waxoil in the colour of your choice. 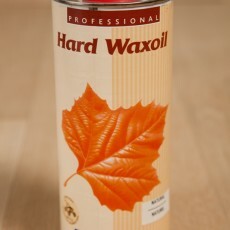 This enables you to create your own unique colour that matches your room’s requirements because Waxoil is available in more than 25 colours, all mixable. 15(4) x 189 ThruFlow Oak Flooring: This Oak Flooring offers our customers approx 15-20% improved levels of thermal conductivity when compared with a standard 15mm thick flooring, which results in tangible savings in heating costs. To demonstrate, if you have an energy bill of £1000 annually, you would save approximately £150- £200 per year (every year) when compared with our standard 15mm engineered oak flooring. 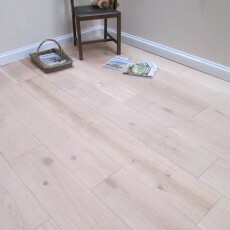 Our 15(4) x 189 ThruFlow Oak Flooring is designed for installation over a supporting subfloor that has UFH bedded within. 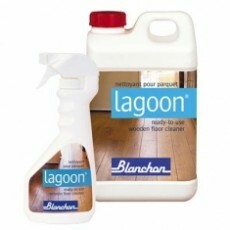 Tests have proven that this product even performs approx 5% more efficiently than other 14mm thick products that have an oak wear layer of just 3mm thick, so you will not only enjoy savings on your heating costs, but the flooring will also last 33% longer. 22(6) x 189 Structural Grade ThruFlow Oak Flooring: Our structural grade 21 x 189 ThruFlow flooring was designed to solve a common challenge with modern construction of dwellings and homes, by providing the ability to install an incredibly durable and hard wearing timber flooring over your underfloor heating, without the need for a full supporting subfloor. 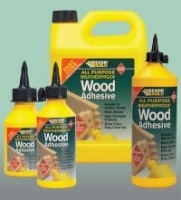 Therefore our 21(6) x 189 Structural Grade ThruFlow Oak Flooring can be installed directly onto floor joists that are fixed themselves at no more than 400mm centres, without further support between. Similar to our 15mm ThruFlow Oak Flooring, tests have shown that our 21mm ThruFlow flooring generates savings of approx 15% on heating bills. For further information about our unique ThruFlow Oak Flooring and how much it can save you, or to enquire about individual specifications or installation information, a member of our dedicated customer service team can be contacted by calling 0800 043 3073. 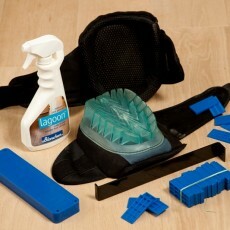 Email enquiries can be sent to us at sales@oakfloorsonline.co.uk.